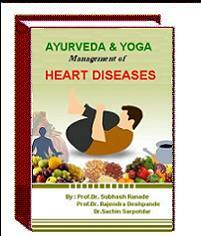 The ebook "AYURVEDA AND YOGA MANAGEMENT OF HEART DISEASES" is a complete and comprehensive manual on the subject. This manual will help Ayurved Practitioners and Students to understand the subject in depth and to manage the cardiac diseases in effective ways. Being diagnosed with heart disease need not automatically lead to angiography, angioplasty or bypass surgery. Reversing it may be as simple as following dietary and lifestyle changes leading to heart cure. Better still is prevention. With this ebook as your guide, there’s no reason to dread this #1 killer anymore. Are stress and heart disease related? Does stress increase the risk of heart disease? Stress is a normal part of life. But if left unmanaged, stress can lead to emotional, psychological, and even physical problems, including heart disease, high blood pressure, chest pains, or irregular heart beats. There is no other ebook like this one. It is for people who want to take charge of their health and transform it, freeing themselves from the deadly influence of drug companies and poorly informed health practitioners. Whether you want to prevent heart disease or beat disease you may already be experiencing, this book gives you the lifesaving information you need to take charge of your health outcome. Wishing you a happier, healthier and heart disease-free life!